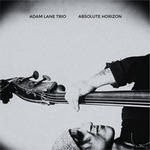 Bassist Adam Lane has been quite active of late, releasing three albums on the past few months, in addition to playing with his Full Throttle Orchestra. On this album, he is in the excellent company of Darius Jones on alto saxophone and Vijay Anderson on drums. This is the first album Lane has done to date that was totally improvised in the studio and it provides the group with a large canvas on which to create their music. This format definitely plays to their strengths as they display on “Stars” where whirlpools of sound descend like wild dervishes with saxophone and bowed bass leading the charge. "The Great Glass Elevator" moves dynamically through raw blowing and subtle bass playing, while “Run to Infinity” develops from a cautious beginning to a torrid collective improvisation. “Apparent Horizon” develops patiently at length, featuring billowing saxophone, rolling drums and thick elastic bass. There is a spacious midsection fraught with tension, waiting for the finale which is a long blowing emotive saxophone and drums. “Bioluminescence” adds subtle electronics to the mix, as if the music had begun to glow itself. This is an experimental track that works well, with bass and drums building an excellent foundation. Raw saxophone weaves through the maelstrom, deep and powerful. “Light” finishes the album with a fast paced trio improvisation, developing very nimble bass and drums with flurries of saxophone gliding overhead. This was a gutsy move for Adam Lane to develop a totally improvised LP but it works very well. The musicians are locked in deeply and support each other throughout. Absolute Horizon - NoBusiness Records.